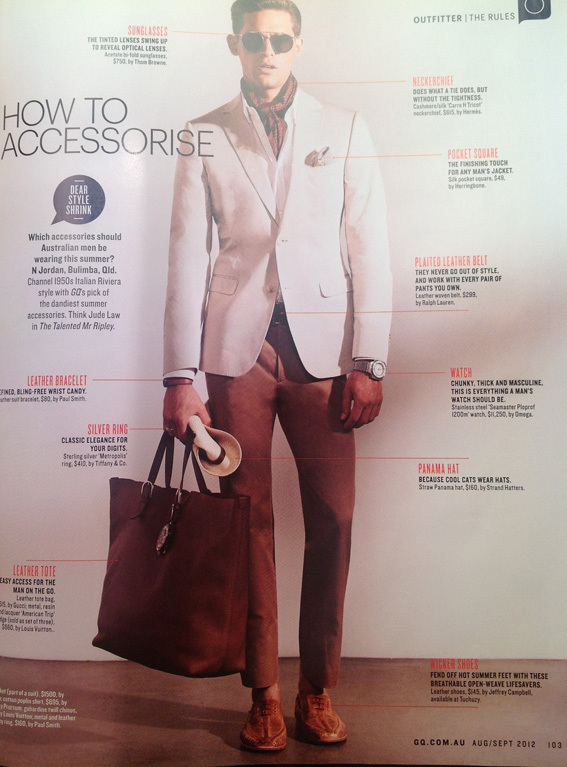 Knowing how to accessorise is the key for success for any menswear range this season. Summer is just around the corner Australia. We know what it looks like; blue skies, clean beaches, crystal clear water, green grass and a beaming sun. But now it’s time to think about what you will look like. GQ magazine recently produced two articles about men’s fashion for the 2012/13 outdoor season. The first is an outfit designed to be meaningfully relaxed but stylistically sophisticated. Adorned in the placid colour scale which typically marries a man with his favourite time of the year, this suit is completed with some fine accessories which the Guild draws your attention too. A chunky silver watch on one hand opposite a silver ring and brown leather bracelet on the other fits the colour trend, as does the Panama hat (held not to destroy one’s hairstyle) and the brown Leather tote. This matching masterpiece is then complemented by tinted sunglasses, a loosely worn neckerchief and a flaring pocket square. The second page compiles a list of ten things GQ loves right now and are guaranteed to brighten up your summer. Seven of them are accessories. The first, surprisingly, are towels you wished had been invented years ago. Don’t forget to add something to catch onlookers eyes and GQ points us in the direction of watches, sunglasses, bags and a quirky lapel pin. Throw on a comfortable hat to create your own shade of life and your ready to sun yourself in a ray of glory. Be Guided by the Guild! !